Blair Bollinger is the Bass Trombonist of the Philadelphia Orchestra where his chair is endowed by Dr. Bong and Mi-Wha Lee. He joined the Orchestra in 1986 at the invitation of Music Director Riccardo Muti and enjoys the full Orchestra schedule of more than 150 concerts each year along with many recordings and international tours, spanning the tenures of Muti, Wolfgang Sawallisch, Christoph Eschenbach, Charles Dutoit and Yannick Nézet-Séguin. As a soloist, Mr. Bollinger has performed with The Philadelphia Orchestra, Atlanta Symphony, National Symphony of Taiwan and others. He has performed recitals and given master classes in Brazil, Chile, China, Holland, Israel, Japan, Korea, Poland, Taiwan and throughout the United States. As a student he won the 1986 Philadelphia Orchestra Greenfield Competition and remains the only trombonist to win this competition since it began in 1934 as well as the only bass trombone soloist ever with the Philadelphia Orchestra. 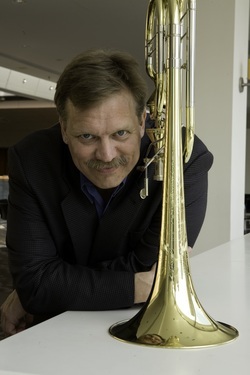 In March 2007 he performed the World Premiere of a Bass Trombone Concerto written for him by Philadelphia composer Jay Krush with the US Army Orchestra at the Eastern Trombone Workshop. His trombone is the Bollinger Model bass trombone by the S.E. Shires Company of Hopedale, MA; a trombone Mr. Bollinger helped design. His recordings include a solo disc, “Fancy Free”, for d’Note Records, hailed by American Record Guide as “The recording I’ve been waiting for ... an amazing display of Bollinger’s virtuoso skills.” Other recordings are 2 discs with his trombone quartet "Four of a Kind", a Gabrieli disc with the Canadian Brass and a forthcoming disc of the Krush Concerto with the Temple University Wind Ensemble. With “Four of a Kind”, Mr. Bollinger has toured Japan, Korea, Taiwan and the U.S.
An active arranger, his arrangements of music for various string and brass ensembles are published by Alphonse Leduc in Paris, Ensemble Publications in New York and Southern Music in Texas. A respected teacher, Mr. Bollinger is on faculty at the Curtis Institute, Juilliard School and Temple University. In addition to teaching lessons, he coaches chamber music and conducts many classes and sectional rehearsals. He has spent recent summers performing and teaching in the National Orchestral Institute in Maryland, Grand Teton Music Festival in Wyoming, Eastern Music Festival in North Carolina, Aspen Music Festival and Bravo Vail in Colorado, New York State Summer School for the Arts and Luzerne Music Center in New York, Bar Harbor Brass Week in Maine and the Lindenbaum Music Festival in Seoul, Korea. A 1986 graduate of the Curtis Institute of Music, he studied with Charles Vernon and Glenn Dodson. Mr. Bollinger has also been very active in backstage administration work at the Philadelphia Orchestra and Curtis Institute. At the Orchestra he has negotiated union contracts, served on marketing and education committees and chaired the committee that selected Music Director Yannick Nézet-Séguin. He has been a member of the Board of Trustees at Curtis and has served on many Faculty and Board committees.